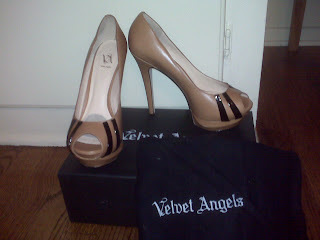 I found the ‘La Loco’ style on Bluefly.com (http://www.bluefly.com/Velvet-Angels-tan-leather-'La-Loco'-platform-pumps/cat20458/305615302/detail.fly?referer=ca_froogle&cm_mmc=ca_froogle-_-na-_-womens_shoes-_-305615302&mr:trackingCode=B1B1BCDF-6B4D-DF11-BAA3-0019B9C043EB&mr:referralID=NA) and ordered them with the excitement like it was Christmas. When they arrived, I was jumping with joy. I couldn’t wait to feel this extra padding hug my feet. The first day I wore them to work, I was seriously amazed. I have to say that after testing these babies out, they really are fantastic shoes. I had some hiccups with my order but the fab team at Bluefly.com and Leslie Nelson, Director of Customer Sales, came through to make me a happy camper. Very special thanks to Leslie and her team at Bluefly. 'La Loco' comes in tan, black and yellow. I’m looking forward to seeing more of the Velvet Angels fashion-forward styles that are all about the pleasure principle. Oh those are hot shoes! very chic! and comfy?? damn jackpot! good find! Visiting you from the LBTP!! LUV these shows!! What a great find!! You bet Ms. Stella! ;) Glad to help out.